Funded PhD Opportunity Using high resolution remotely sensed data to calculate hedgerow volume within an agricultural landscape. European hedged landscapes provide a range of ecosystem services and are an important component of cultural and biodiversity heritage. Greenhouse gas (GHG) emission reductions in land use are largely associated with forestry. It is suggested that there could be a potential GHG mitigation in hedges with respect to accountable removal units (RMUs) under the Article 3.4 of the Kyoto Protocol. The only currently available methods for assessing hedgerow density involve detailed surveys, or by destructive sampling of hedgerows. These methods are not suitable for scaling up of national estimates due to time and cost constraints. Developments in remote sensing offer the possibility of developing a national reporting system for the estimation of hedgerow density. Recent advances in remote sensing, particularly through Unmanned Aerial Vehicles (UAV), have led to the provision of very high resolution imagery. Multispectral imagery is now available at less than 1 metre and this imagery can be used to automatically map small features in the landscape. Coupled with the production of high spatial resolution imagery is the capacity for aerial photogrammetry applications with a possible accuracy down to 1 to 2 cm. In addition to aerial photogrammetry is the potential to use Lidar data to generate 3D point clouds of surface features. There is considerable opportunity to combine 3D point cloud data with high resolution multispectral imagery to create models of hedgerow volume from which to inform land use policy. This interdisciplinary PhD project involving the Geography and Environmental Sciences Research Institute and Intelligent Systems Research Centre will build on the expertise developed in both research centres to focus on hedgerow mapping and density estimation using remote sensing data and novel machine learning techniques. The increase in computing power has enabled the use of powerful machine learning algorithms on large datasets. Recent breakthroughs in computer vision methods and deep learning models for image fusion, image classification and object detection now make it possible to automatically obtain a much more accurate model of environmental features than could be achieved previously. Advances in deep learning methods now permit the analysis of UAV imagery which shows great potential for measuring hedgerow density. Much existing remote sensing work has focussed on the application of convolutional neural networks for land use classification. Deep learning architectures which are pre-trained on natural images from the ImageNet dataset are often used due to a lack of appropriately labelled land-use image data. In this approach, called transfer learning, a deep network is first trained using the ImageNet dataset and then the network weights are refined using a smaller set of labelled land use images. In this project, low-level (pixel) image processing approaches and object-based approaches will be used in conjunction with fusion of aerial photogrammetry and multispectral imagery for hedge density measurement. Algorithms will be developed to automatically learn hedgerow representations using a deep neural network in a data-driven fashion. Based on these highly discriminative representations, density measurements will be determined and predicted using low-level and object based labelling of the photogrammetric and multispectral images. 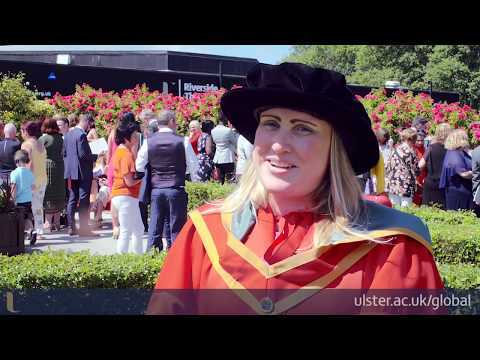 I would highly recommend Ulster University as you get so much support. Coleraine is a beautiful town and the people are so friendly. It was a really positive experience.